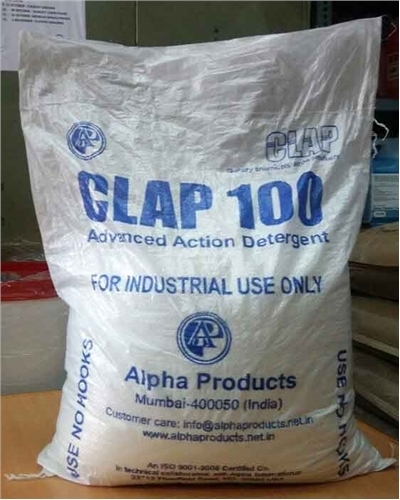 CLAP 100 is a advanced action detergent free flowing powder and nonionic in nature. CLAP 100 is completely soluble in water and is used for washing and cleaning of F & B linen, hospital linen, engineering and workshop overalls. CLAP 100 is a complete and efficient powder for all types of fabric. It quickly removes all dirt particles and heavy soil. It easily removes different kinds of stains like oil, grease, ink, rust etc. It works efficiently in hard water also. It enhances colour brightness of the fabric due to florescent optical brightening agent present in it. Dosage: Use 5 to 15 gm of CLAP 100 powder for 1 kg of dry linen, soak the fabric and wash. PACK SIZE : 25 Kgs.